Peel, core, and slice apple. Cook apple slices in 1 teaspoon melted butter in a sauce pan over medium heat until soft. 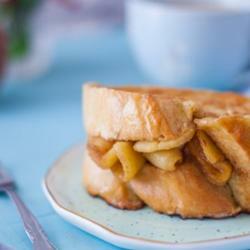 Drain apples and toss in 1/2 teaspoon sugar and a dash of cinnamon. Whisk together half-and-half, egg, vanilla, sugar, cinnamon, and nutmeg and set aside. Cut a pocket into the very thick bread slices almost all the way through. Stuff each bread slice with the apple mixture slices (depending how big your bread slice is you may not use all of the apple). Put apple stuffed bread into a baking dish. Pour liquid mixture over the bread and let stand for about 15 minutes. Heat a large skillet on low heat and melt butter. Add bread and cook for about 5 minutes on each side. Dust with confectioners' sugar if you please and enjoy.